The iPhone gets the hype, the iPod continues to capture public interest, and the Mac enjoys the best sales in its history. But what of the Apple TV ? Business blogger Philip Elmer-DeWitt went so far as to call the Apple TV “Steve Jobs’ Forgotten Child,” speculating that Apple’s TV set-top did not perform as well as the company hoped it would, in terms of sales. Why the lack of buzz for a product that was released just five months ago? While providing only a small barometer, Macworld forum posters expressing disinterest in the Apple TV shared two common complaints—the lack of a video rental system and concerns about picture quality. This is where Vudu comes in. Aiming to revolutionize the TV set-top experience, the Vudu box connects directly to a broadband connection and a television or display, allowing you to choose from a vast collection of movies to rent and stream. I had a chance for some face-time with the box; here are some initial impressions. First, some specs: The Vudu is a compact, black box weighing 7.5 pounds. It contains a 250GB hard disk drive—enough to store approximately 100 hours of owned movies. As for video quality, the Vudu’s movies are encoded in MPEG4, and the hardware supports HDMI v1.1, Component, S-Video and Composite connections. For audio, the Vudu supports HDMI v1.1, Digital Optical, Digital Coax and RCA. There’s a lot to Vudu, and it’s very different from the Apple TV. For the sake of being concise, allow me to bullet-point the major differences. Vudu gives you the options to rent and purchase movies, whereas Apple TV only lets you purchase movies. Vudu has partnerships formed with every major studio and 18 independent studios, providing about 5,000 movies. The iTunes Store offers more than 500 movies from Disney, Paramount, Lions Gate, MGM, and IFC. Vudu connects to the Internet directly via Ethernet to stream movies, allowing you to watch them instantly. Watching movies on Apple TV requires downloading them through the iTunes Store onto your computer, and then synching your iTunes library with your Apple TV. Apple has partnerships with 58 broadcast and cable networks, allowing you to choose from 550 TV shows on iTunes— The Vudu currently does not have deals with any TV studios. So that’s how the comparison breaks down. But how well does the Vudu perform? After some time with an evaluation unit, my initial impressions of the Vudu are very positive. The Vudu comes with a unique remote control. Small, black, smooth and shaped like an overgrown peanut, the Vudu remote does not initially appear ergonomically correct. But you’ll be surprised at how comfortably it rests in the palm of your hand. Below the power button toward the top of the remote is a small, vertical scroll wheel for your thumb, which you use to navigate through the Vudu menu very smoothly and easily. To select a movie or option on the Vudu menu, you simply click the scroll wheel. There are four other buttons: a back button, a play/pause button, a Vudu main menu button, and a “More” button. Overall, I’m very pleased with this design; it’s so intuitive that I learned how to use it in just seconds. And I love that the scroll wheel eliminates the need for button mashing to get to the movie I want to watch. Vudu’s menu is also very cool and intuitive. The main menu is a black screen containing five options: Find Movies, New Releases, My Movies, My Wish List and Info & Settings. Below those options are side-by-side poster images of currently featured movies, which you can quickly choose to watch. I was most impressed with the organization scheme that Vudu presents for browsing through its movie library. After choosing the Find Movies option, the Vudu menu gives you several ways to pick a flick. If you’re in the mood for an action movie, for example, you can browse the movie library using the Explore Genres option. If you know exactly what you want to watch, you can choose Search By Title, and type in the title using the menu’s interactive keyboard. If you feel like watching a movie by a certain director or featuring a specific actor, you can choose Search By Actor or Director and quickly punch in the name. Lastly, there are two more options to browse lists of Vudu’s Top Rated as well as Staff Picks. 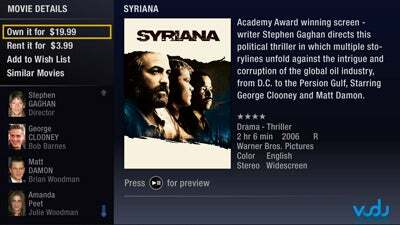 Film buffs and movie fanatics alike will appreciate that once you click on a movie, the Vudu menu displays additional information, including the movie’s cast, director, synopsis, star-rating, studio, and run-time. From here, you can even click on the director or actor names and browse through other movies by that director or featuring those stars. The Vudu doesn’t magically download an entire video the instant you click the rent or buy button. Instead, it streams video, meaning you watch the video as it downloads; you can only fast-forward through the entire video once it finishes downloading. This may set off red flags for potential buyers who fear video-buffer lag. The Vudu, however, rectifies this issue: the hard drive comes cached with a small portion of every movie. Therefore, you can rent or buy a movie and start playing that pre-loaded portion immediately, likely avoiding any lag. Nevertheless, since the Vudu streams video, it still requires a reasonably fast broadband connection to ensure zero lag. Vudu’s specifications recommend at least a 3 Mbps broadband connection for instant viewing. A 1.5 Mbps or slower connection is conducive to delayed viewing. Something important to note about the Vudu’s video-streaming technology: You’re not only downloading—you’re uploading, too. 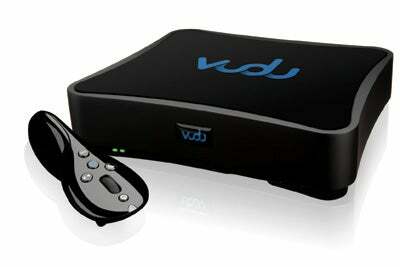 With the box connected to the Internet, each Vudu user essentially contributes to a peer-to-peer network in order to ensure efficient delivery of every movie, according to Vudu. The upload rate is, of course, capped at a reasonable rate so your Internet won’t become sluggish due to the Vudu. To get the Vudu to work with your wireless network, you’ll need to connect it via Ethernet to a wireless bridge. Vudu recommends a router with at least 802.11G for fastest delivery. But since the Vudu won’t move much, I’d recommend playing it safe and connecting the Vudu directly via wired Ethernet. Like the Apple TV, the Vudu currently doesn’t offer high-definition movies. The hardware itself supports HD movies, and Vudu says it plans to offer HD content on the box in the future. I tested the Vudu on a VX2245wm ViewDock monitor and the image was very clear and pleasing overall with accurate colors and great detail. While watching the 3-D-animated movie Everyone’s Hero , I noticed upon close inspection some small, blocky pixels due to the video’s compression. But from a reasonable viewing distance of about 8 feet, the video looked great to me. Overall, the Vudu should be an excellent living-room device despite the current lack of HD-video offerings. The Vudu box costs $399, and there are no subscription or activation fees. Those who opted against purchasing an Apple TV due to the lack of a movie rentals should be pleased with the Vudu’s low rental pricing. One-time rentals range from $1.99 for older films and $3.99 for new releases. Renting a movie immediately activates a 24-hour clock for which you can watch the movie as many times as you wish until your time expires. The price for owning movies ranges from $4.99 to $19.99, depending on the film’s studio, age, and popularity, among other factors. When you choose to purchase a movie, Vudu streams and stores the movie on its 250GB hard drive. The Vudu box is a great sign for things to come in the digital-movie era. I found the overall concept and design to be intelligent and convenient; the technology used to stream movies truly allows you to watch what you want instantly. And since I don’t watch TV, the Vudu’s lack of television programming doesn’t faze me. Regular movie watchers should be very excited about the Vudu: it takes another step toward sparing you a trip to the video store, bringing entertainment within immediate reach. This article was reposted to clarify information about wireless networking with Vudu.